Did you see hail last night? 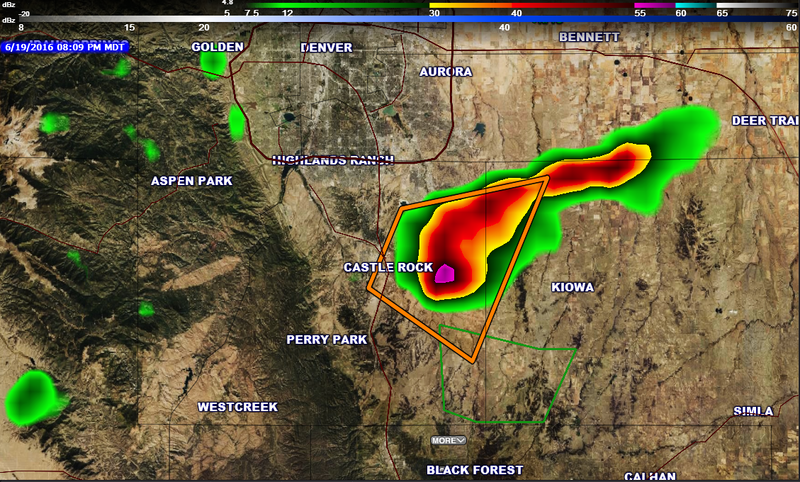 Many areas along the Palmer Divide did, especially Eastern areas of Castle Rock all the way out to Limon and some areas in Southern Douglas County saw a bit of hail later in the evening as well. When I checked with the Storm Prediction Center’s report I saw no mention of severe weather anticipated in the Palmer Divide area and other than a marginal risk area in Northeastern Colorado it was supposed to remain quite. 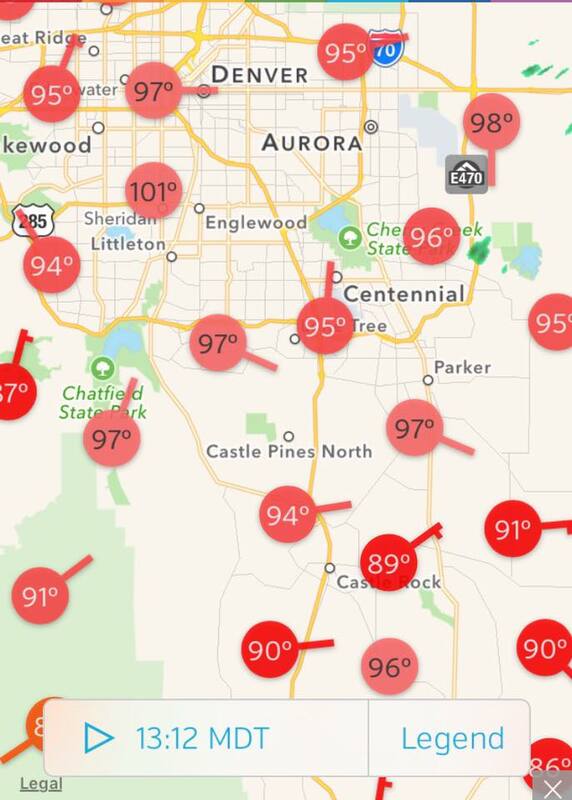 If you were out and about Sunday, you knew how hot it got. Many locations in the metro area flirted with 100 degree temperatures and areas along the Palmer Divide were well into the 90’s. To see how the storms in the evening evolved we have to start in the morning. We get Skew-T diagrams every day at 5AM and 5PM in the summertime, these diagrams help us see what the atmosphere is like at different altitudes. They are done every day by the NWS and collect data by sending a weather balloon into the sky with a data recording device that records wind speed, wind direction, temperature, dewpoint and a whole host of things. Winds were weak at the surface, this means weak wind shear and in turn not a good environment for long lived severe storms. We use the term “pulse storms” to describe these as they flare up very quickly and die almost as quick. 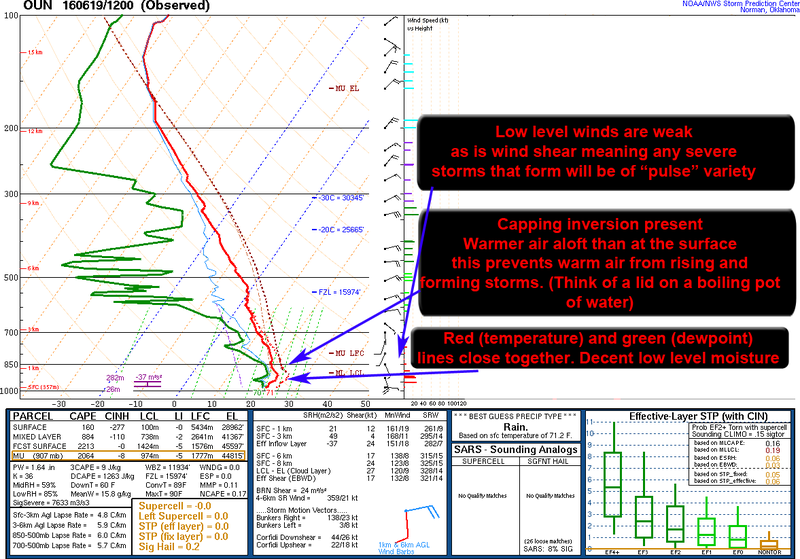 A capping inversion (warm air aloft in the environment) prevents hot air at the surface from rising and forming storms. The best analogy here is to imagine a boiling pot of water and a lid on top, none of the steam can rise above that lid. Low level moisture was decent as dewpoints were high meaning humidity was as well. This would explain a muggy feeling you get in the mornings. The biggest thing to remember is the atmosphere is always changing, the 5AM sounding is not the end all be all for weather that day, it just shows you the potential the atmosphere has. The picture above illustrates how a temperature inversion works, basically a layer of warm air in the atmosphere prevents cooler air at the surface from rising. To form thunderstorms you need the air at the surface to be able to rise, if the air above is warmer the air at the surface can’t rise and you won’t have any storms. On a super hot day like Sunday, this is often the case and we never see storms because the air aloft doesn’t allow the air at the surface to rise. The first way to break a cap is to make the air at the surface warmer than the air aloft. This will then allow rising motion and thunderstorms to form… this didn’t happen yesterday as the temperatures aloft were way too warm. 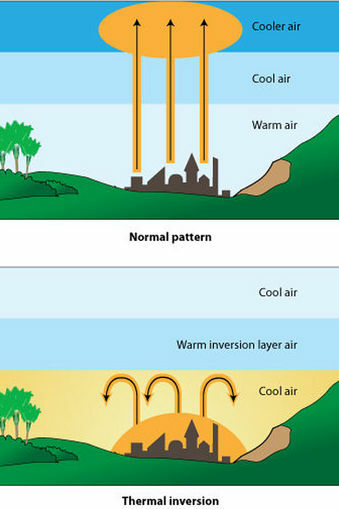 The second way is to systematically lift the air at the surface above the inversion, this can be done if a front moves through or a storm system moves in and brings lift. This is exactly what happened to us yesterday. 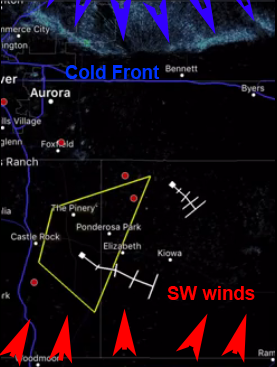 The cold front racing through creates an area of “convergence” where winds from a North direction behind the front begin to push against winds from a Southerly direction ahead of the front. This causes lifting in the atmosphere and as the wind collides it has only one direction to go… up. 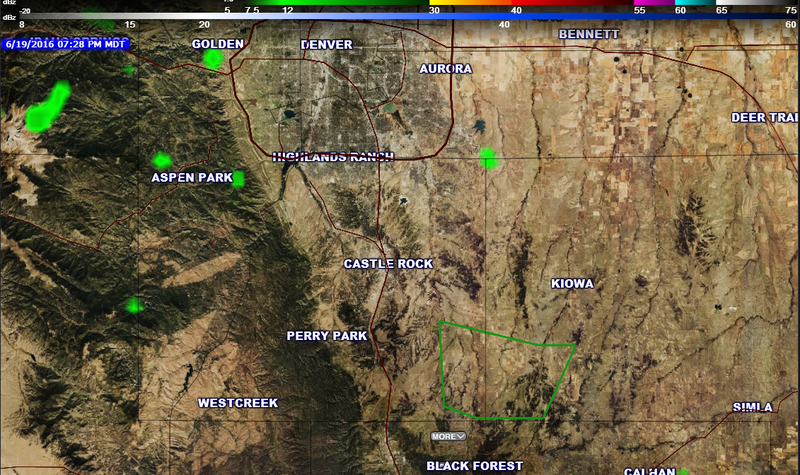 This is very common to Colorado and is often the cause of severe weather for us. Because of the huge amount of lift and instability in the layer of air above the cap, these storms fired incredibly quickly. At 7:30 clouds were beginning to pop but there were no storms yet formed. 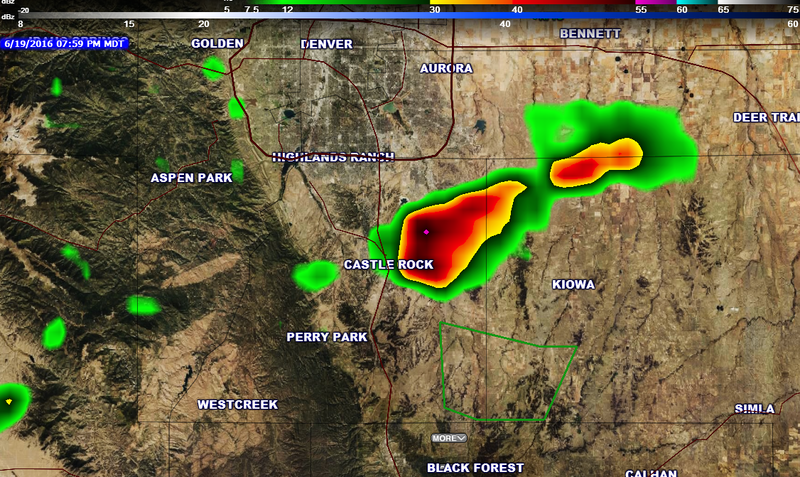 And just 10 minutes later we had a severe warned storm with reports of golf ball sized hail! Referring to my early statement, Colorado’s doesn’t always play by the rules, which is still very much true. The interesting part about yesterday is that the weather did play by the rules… the rules said in the morning there was little to no chance of storms forming. By late afternoon into evening the rules changed; the cold front racing through changed the makeup of the atmosphere very quickly. Hopefully this gives everyone a bit of a look on how things set up yesterday and why we got such a quick and surprising storm! SPC has our area under a Marginal Risk for severe weather today. 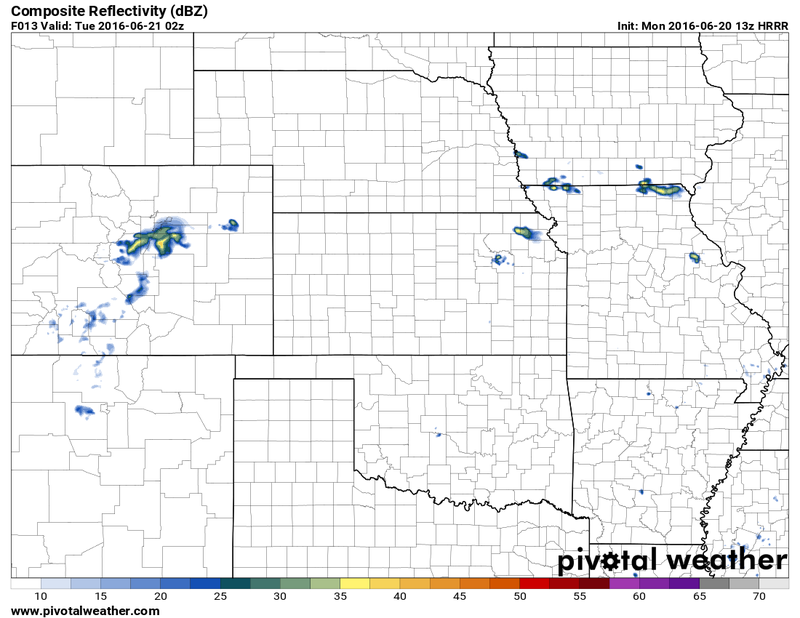 Just like yesterday, any storms that pop up will be very scattered and any one area’s chance of seeing storms is low. 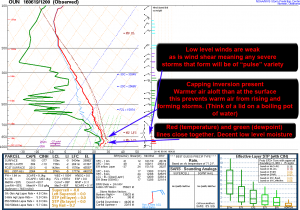 That being said, the atmosphere is similar to yesterday so be wary of a pop-up severe storm in the area. 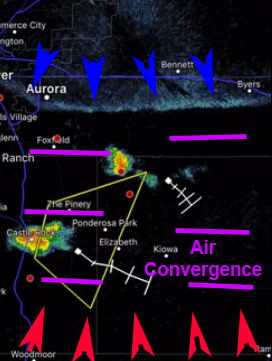 Models show something in the Palmer Divide area between the 6-8PM time frame so stay heads up! Thanks for tKing the ti e to make these educational and interesting posts!